In the April issue of Mobile Wallet Outlook the NFC World team examines why NFC is failing to gain traction in the mobile payments market, analyzes the range of cloud-based options available for those seeking to deliver mass market mobile wallets — and sets out in detail how MCX’s barcode and cloud-based wallet will work, when it’s likely to launch and who is already using the same approach today. 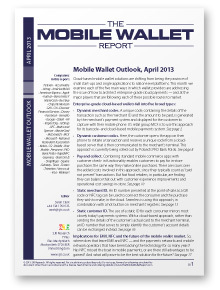 In the new issue of Mobile Wallet Outlook, the monthly briefing for subscribers to The Mobile Wallet Report, the NFC World team takes an in-depth look at cloud-based mobile wallets and examines why banks and merchants alike are increasingly adopting this approach to mobile payments. “Cloud-based wallet solutions are shifting from being the province of small startups and single applications to nation-level platforms,” says Sarah Clark, editor of NFC World and The Mobile Wallet Report. “Merchant-led MCX in the US, whose members account for US$1 trillion in sales at 75,000 locations, has chosen a cloud- and barcode-based platform from Gemalto, Tesco in the UK says NFC might be past its sell-by date and some of the earliest adopters of NFC, like Korea’s KT, are adopting QR and the cloud as well as NFC. “For this edition, we’ve been looking in-depth at the cloud-based wallet options available, talking to the players involved and asking whether NFC has missed the mobile payments boat. 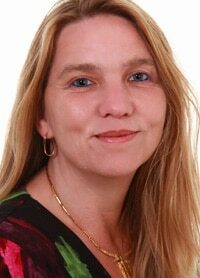 “The big question for NFC payments now, we believe, is how well the NFC industry responds to the challenge presented by the new cloud-based platforms,” says Sarah. “There are two ways those who are already heavily invested in NFC could react. One would be to make an honest appraisal of what the mobile payments landscape really looks like today, adapt to market requirements and press home the advantages of NFC, such as its ease of use compared to QR and other technologies. Mobile Wallet Outlook is a monthly market briefing published as part of The Mobile Wallet Report, NFC World’s business intelligence service for senior decision makers in the worldwide mobile payments industry.